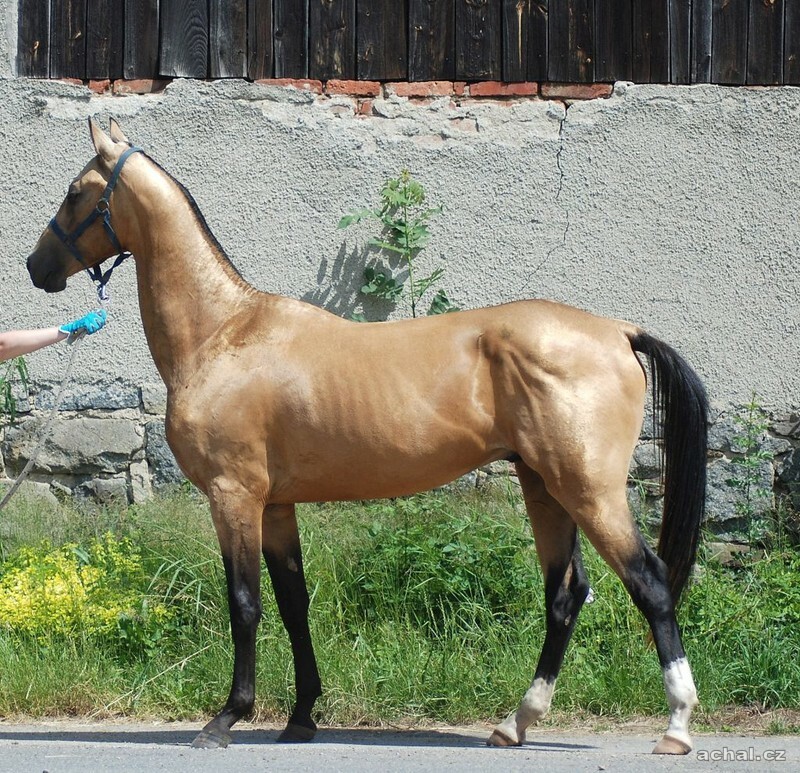 Pahim stallion is calm and excellent character in 2016 won the European Championship (Czech Republic) victories in its category 3-4 year old stallions + also received Reservé champion of stallions. Stallion Schamborant was born in 1996 (after Sultan Baly) - Rating of type 7.7, exterior 8.0, 6.5 measurements,KVH 158 cm, Linie AK Sakal. 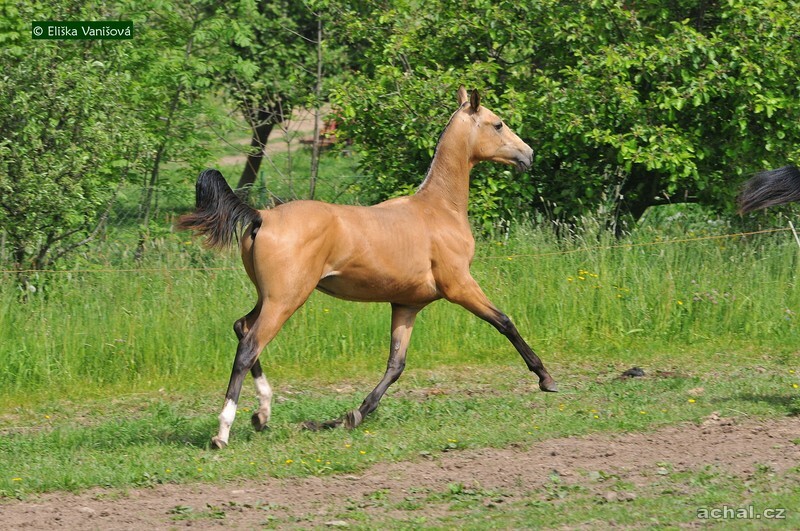 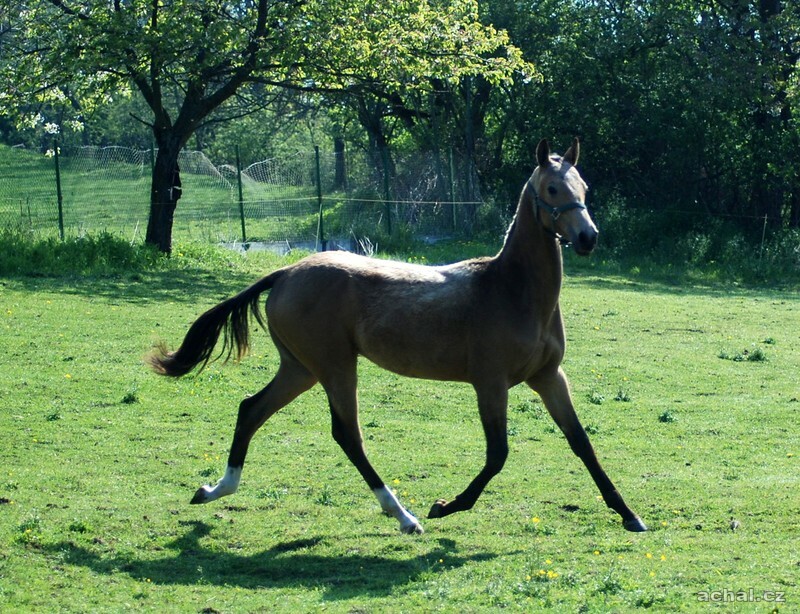 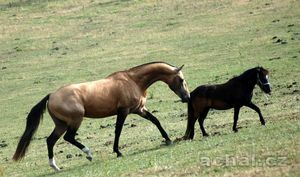 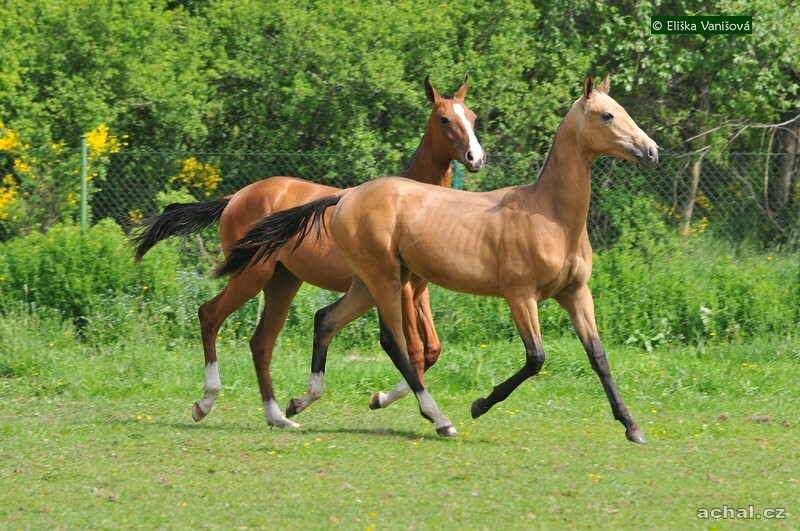 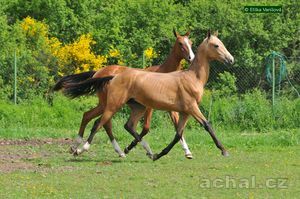 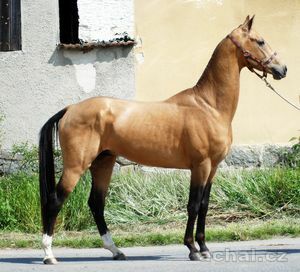 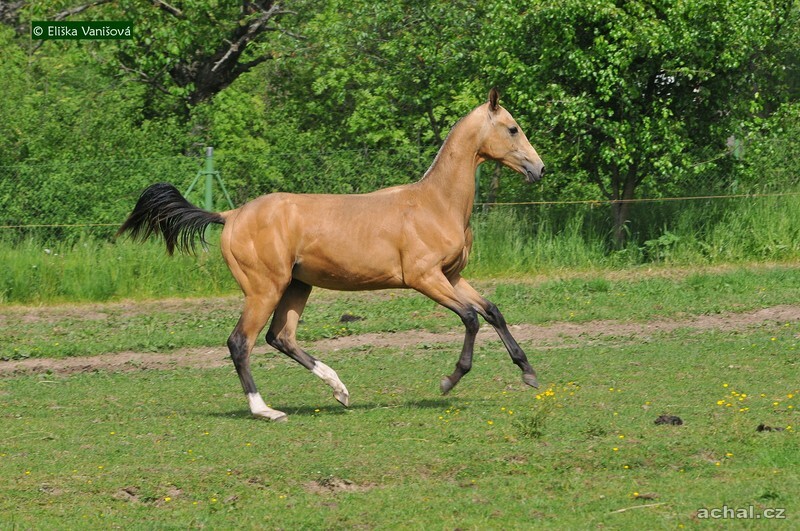 The origin of the founder of the line, Stallion 13 Ak Sakal is derived from the old line Copar Kel (as well as a line of Dor Bairam). 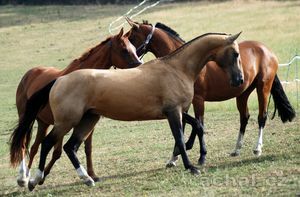 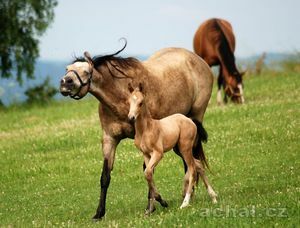 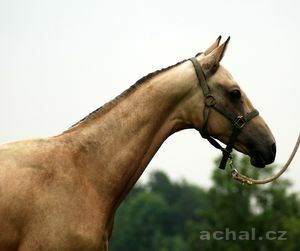 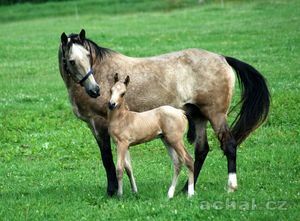 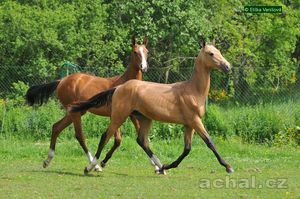 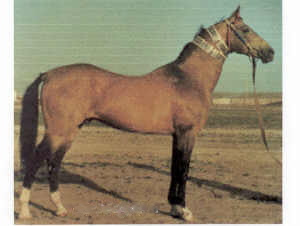 Father Ak 13 Sakala, also Ak Sakal (Ak-Baj Jaridža) was the great-grandson Kurt Baj white stallion that was exported to Iran. 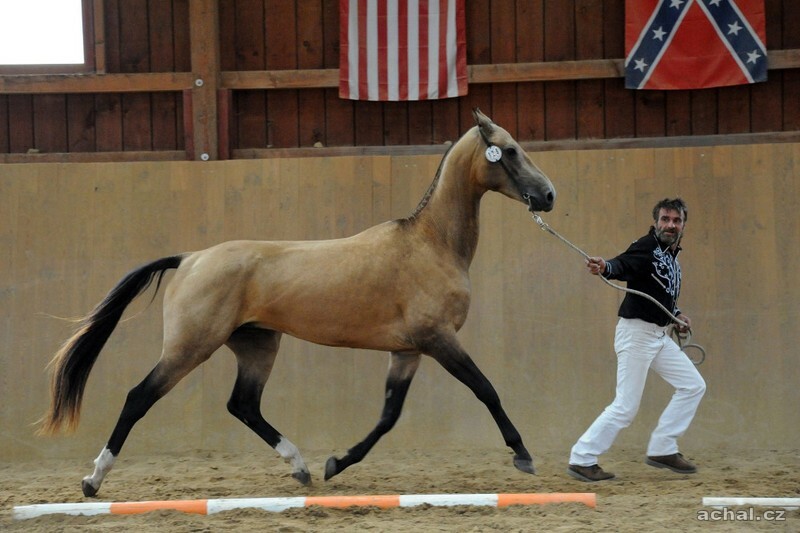 This line was never very large, currently occupied by its members 3.2% of the active population and the Akhalteke breeding stallion can basically count on one hand. 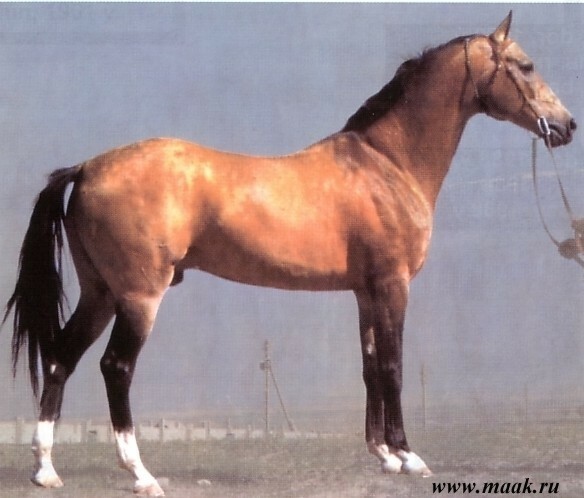 Stallion 13 Ak Sakal was born in 1930, the Ak Sakal stallions, mares from Ilyas. 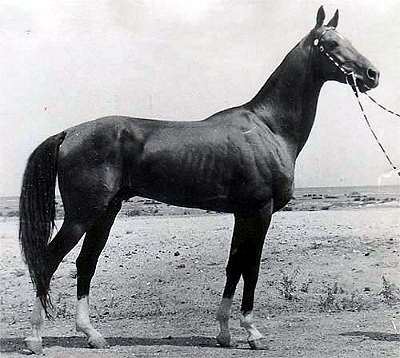 It was small, but dry, regular stallion (152-152-160-19,0), participant legendary march Ashgabat and Moscow in 1935. 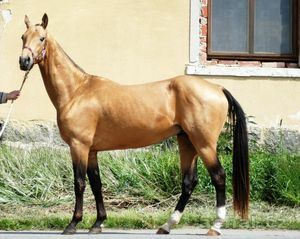 This endurance ride also involved the white mare 279 Kyr Bajtala, which in 1936 gave the stallion 13 Ak Sakal white colt 518 Moscow, who later ran an excellent race at Ašchabadském racetrack. 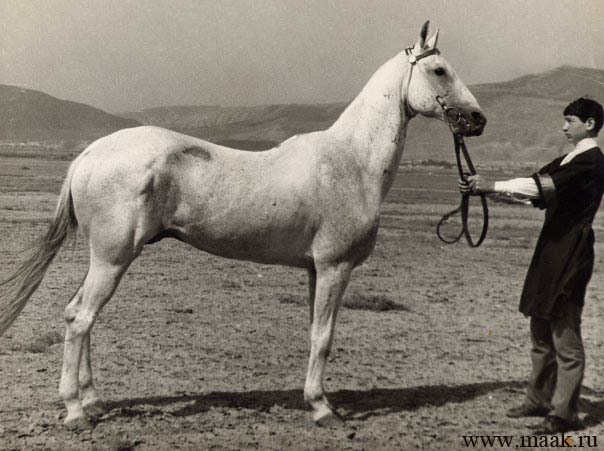 In 1949 the after stallion Moscow 518 born white colt 724 Kara Kir, inbred in stage II-II at Ak Sakala. 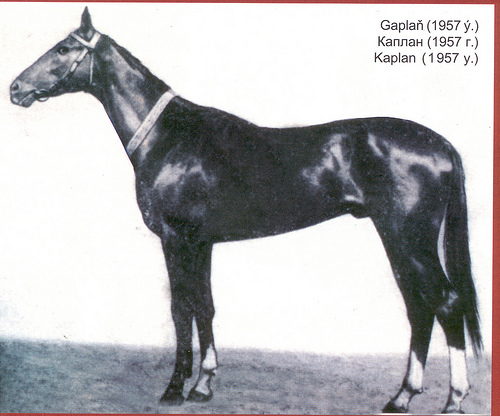 In his pedigree appear the names of the best racehorses of the time - Boinou, Bek Nazar Dora, Everdy Teleke, Ag Isan. 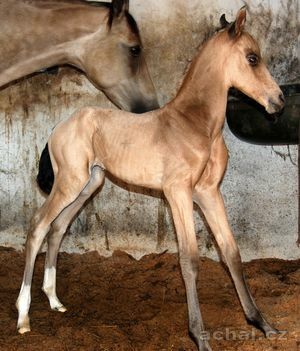 Kara Kir was born a long black horse named Karakunon (meaning black colt) vybělovat started relatively late, in the eighth year of life. 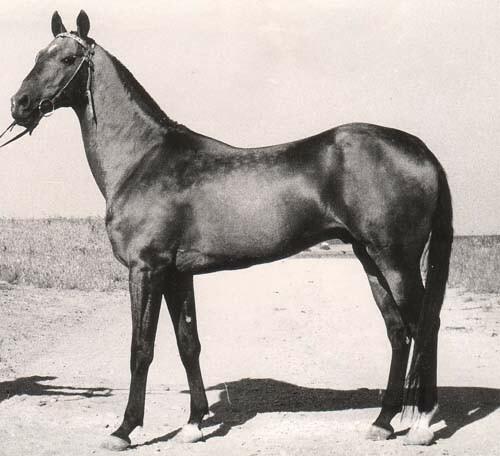 Kara Kir completed a successful racing career on Ašchabadském racetrack, where for many years, paid his record for 1200 m - 1.19,5. 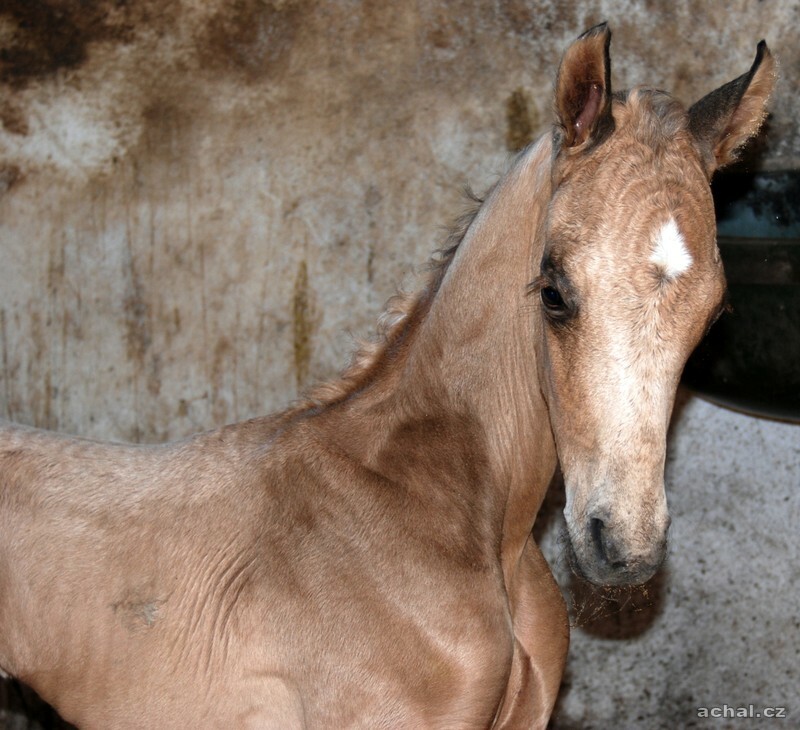 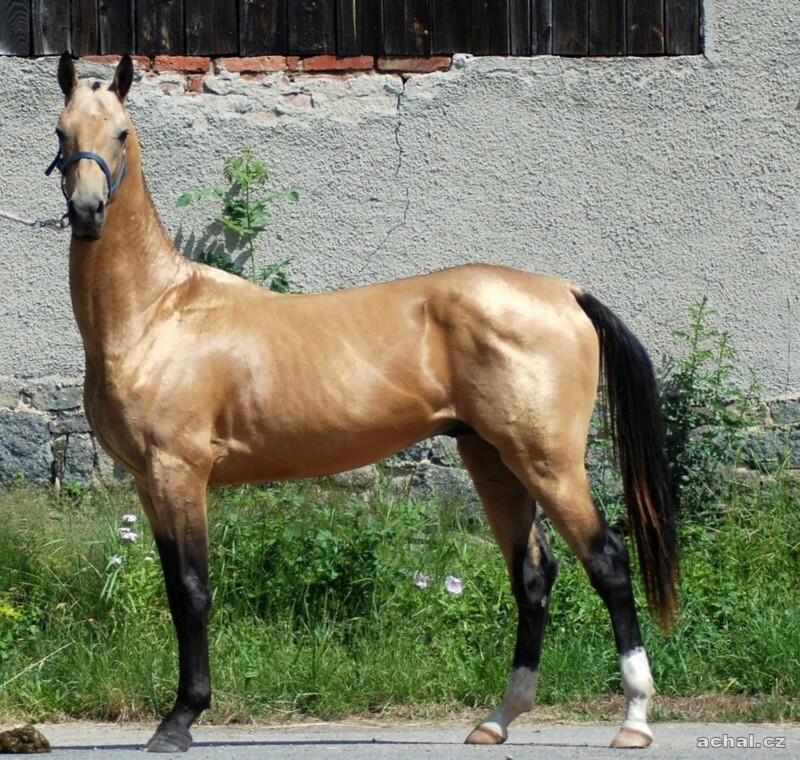 Kara Kir imagined ideal achaltekinského war horse, was sufficiently high, mighty, regular exterior and dry solid konstituce.Míry 157-158-173-19,0, type 8.0, 8.0 degree, 8.0 exterior, performance 9 0, 8.0 offspring including Elita. 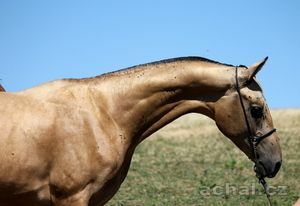 Excelled beautiful head with very long scruff and muscled, well mounted, Deer neck slightly. Almost missed mane. Back line was exemplary, with strong tap, sloping shoulder blade, deep chest and long ribs. 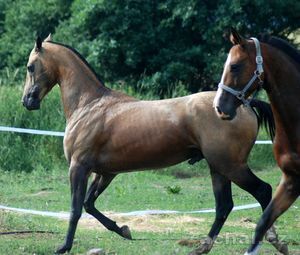 Kara Kir became the sole successor Ak Sakal line. 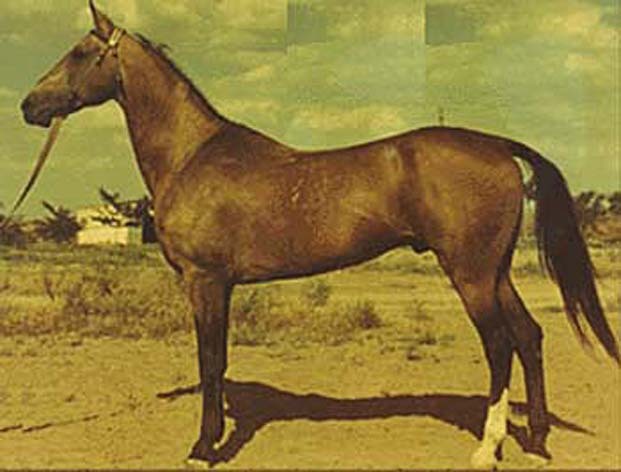 In 1967 it was purchased in Terského stud, where he was under-used, but ironically after the breed remained the only son - 866 Vatanči. 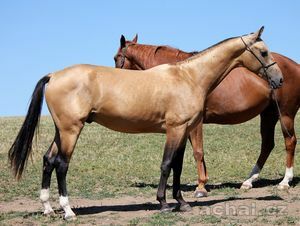 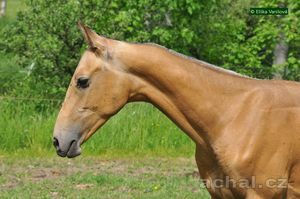 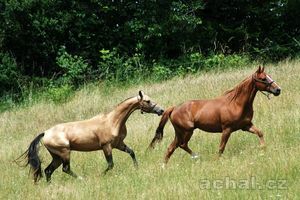 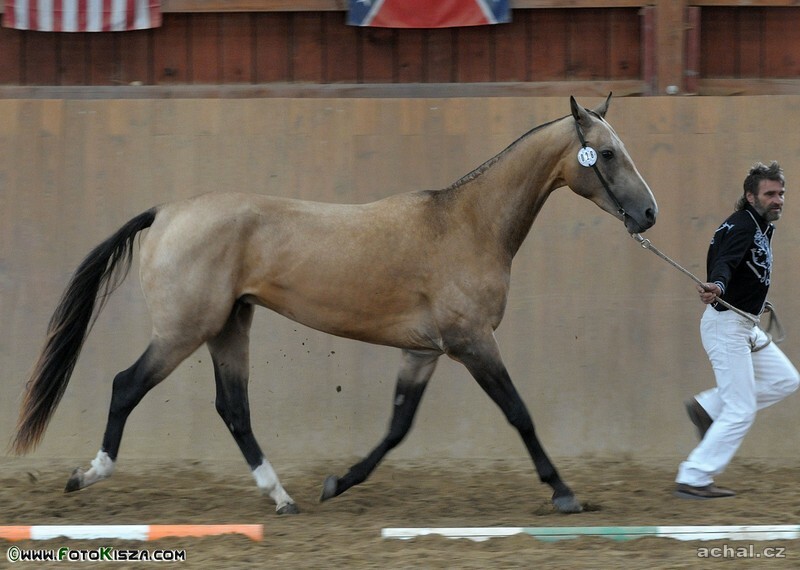 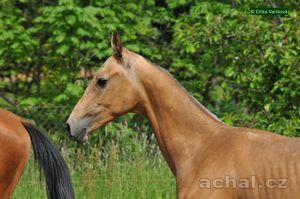 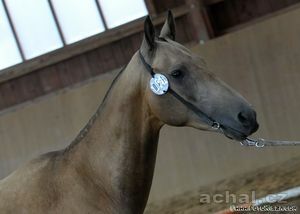 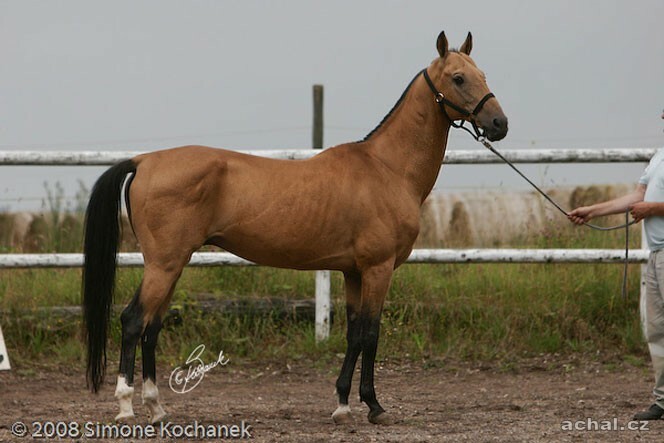 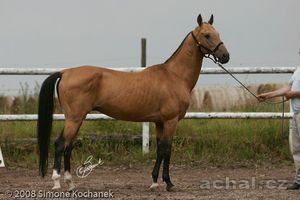 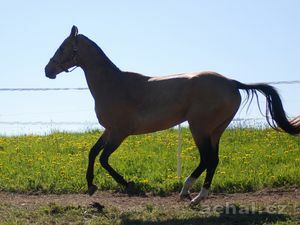 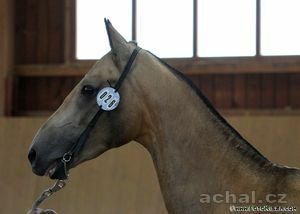 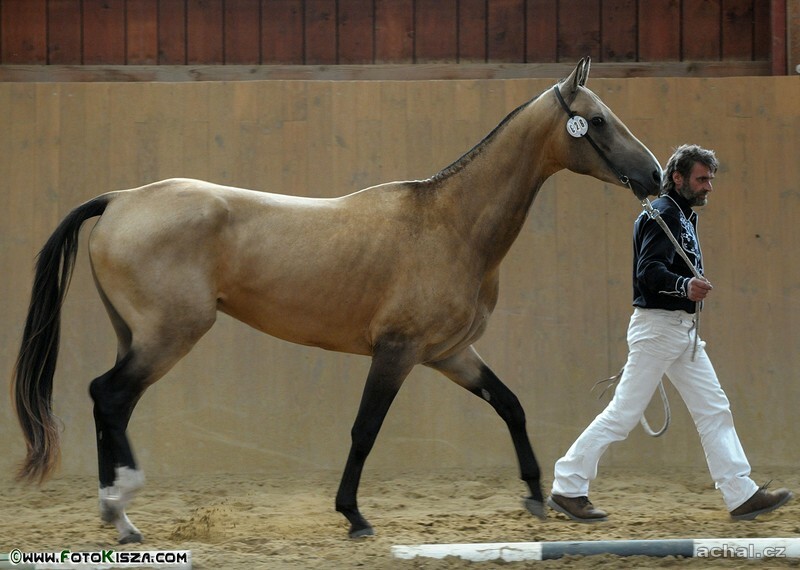 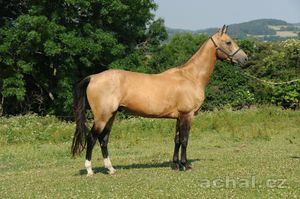 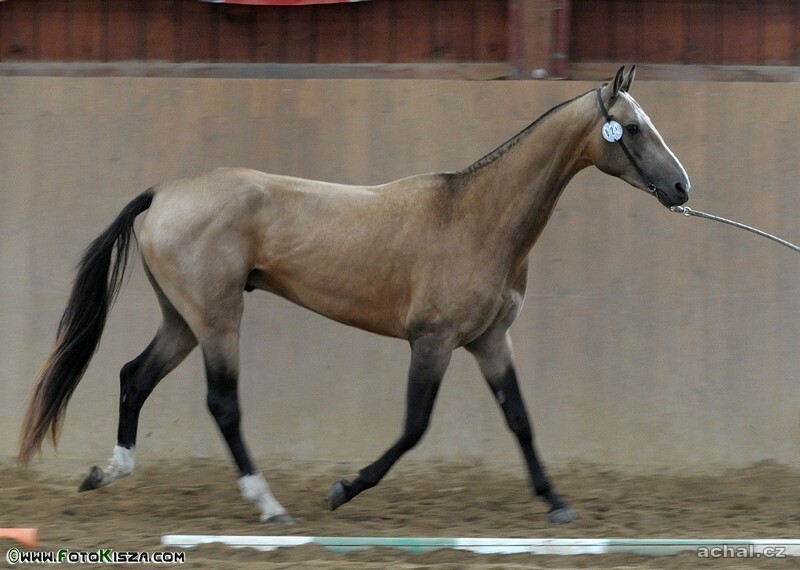 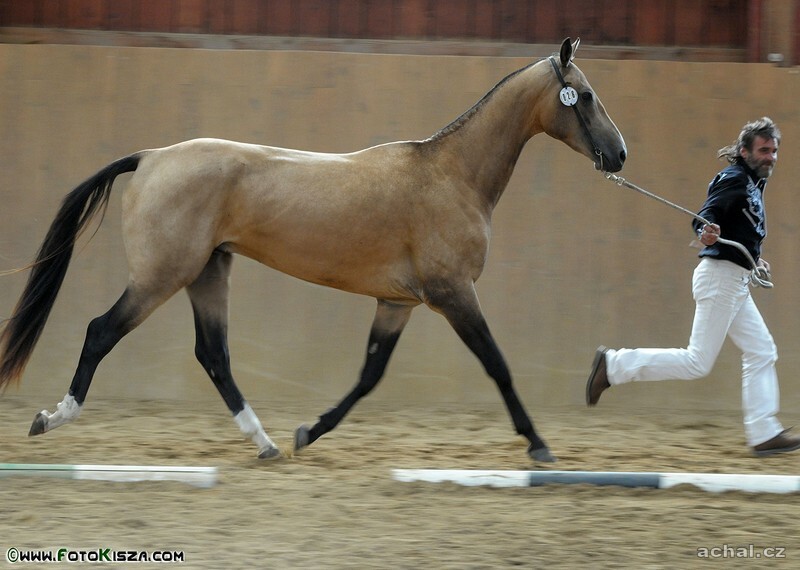 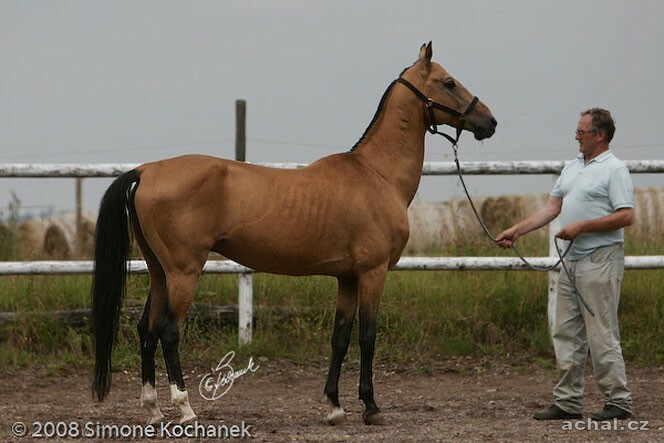 866 Vatanči, golden buckskin born in 1970 at Tersk stud farm, the excellent daughter Gelišikliho, mares Guldžachan. 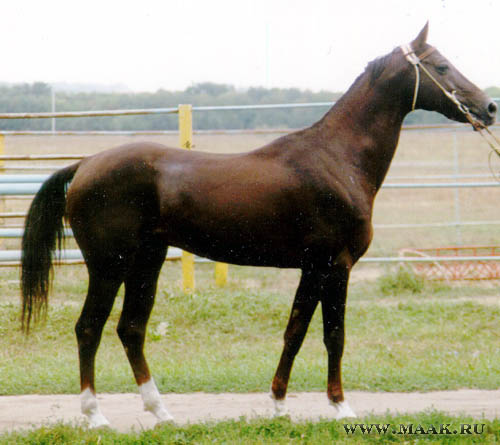 Vatanči graduated racing as three years and eight starts in Pyatigorsk, where he placed a jedenkráte other. 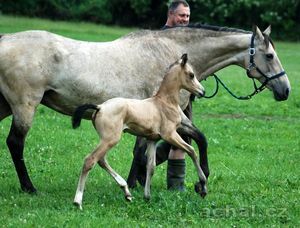 Vatanči was typical achaltekincu that many inherited from his father, Kara Kirov. 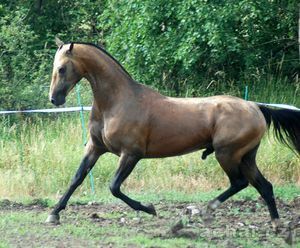 Vatanči as a sire, he worked in Dagestan stud (here given in breeding stallions such as Keledžara 1065) and later in Turkmenistan, where the father of great racehorses Vezipeho and Parada. 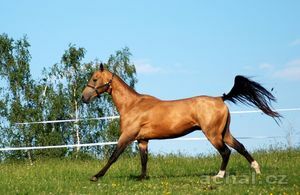 The stud was filed in 1145 and 1146 Vezipe Vepaly. 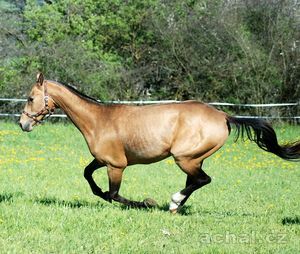 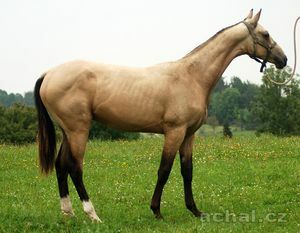 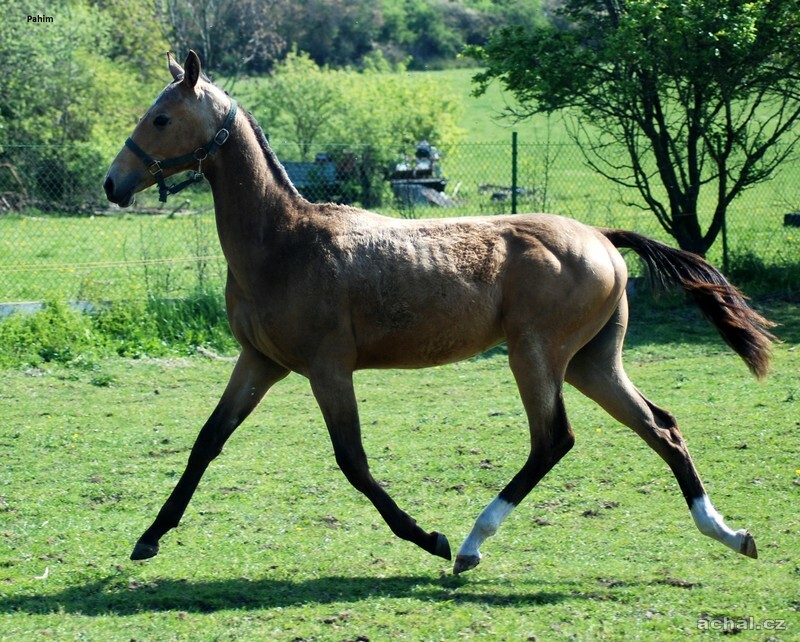 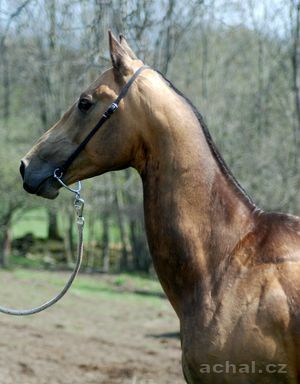 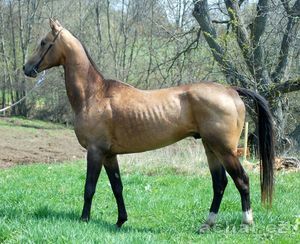 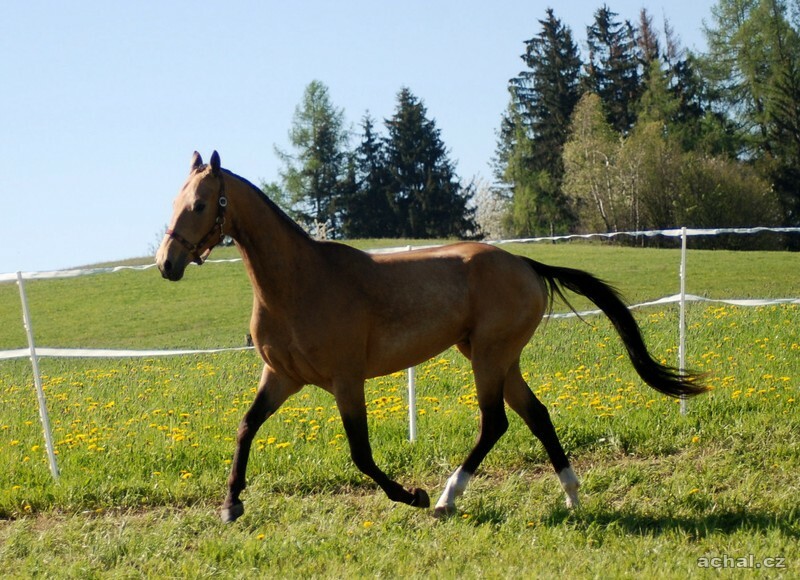 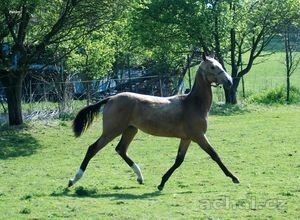 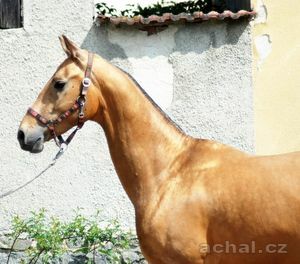 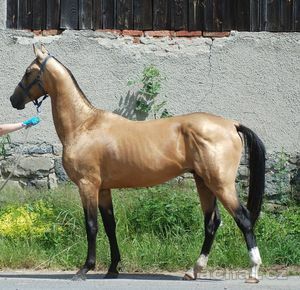 Mother of Vatanči - 1469 Guldžachan - mare was born in Tersk stud and is a true sister of sires 699 Gundogar (after Sere), 874 and 935 Gunešli Julduz. In 2 year completed 5 races, placed second once and twice třetí.Na show in r . I. 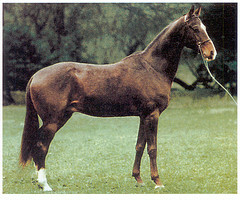 1975 received a diploma degree. 10.00 The assessment type, extent, 8.0, 8.0 exterior, the performance of 6,0, 8,0 progeny - including Elita. 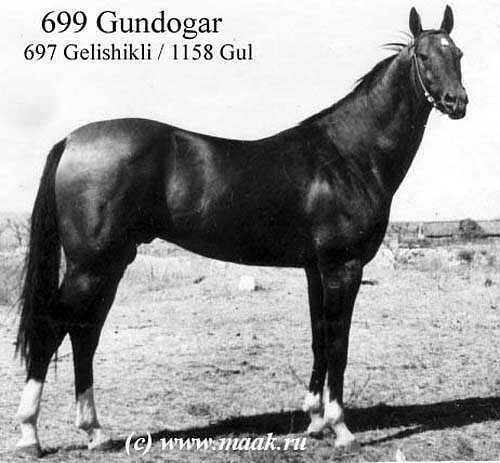 Stallion 933 Chorog - (164-168-184-20,00) massive but typical golden bay was born in 1968 in Kazakhstan at stud Lugovskoj, the Derby winner Gundogar (697 Gelishikli - 1158 Gul) of mares in 1391 Chustka (569 Skak - Chapia 1036). 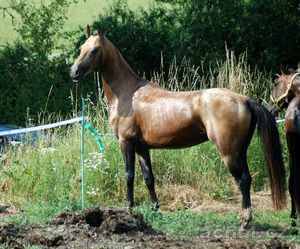 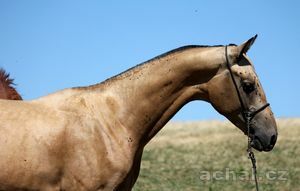 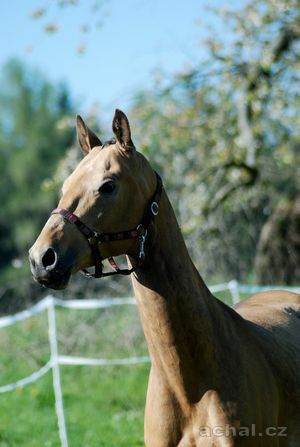 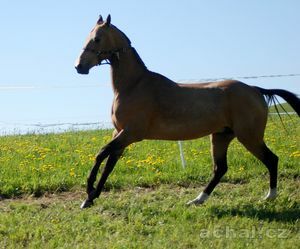 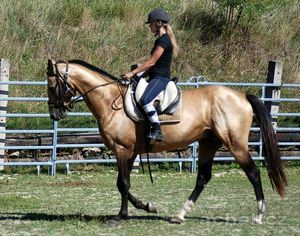 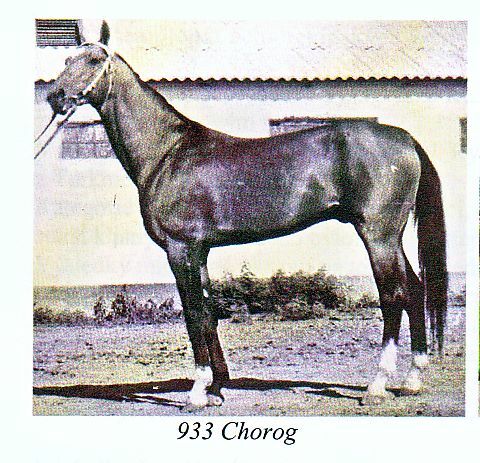 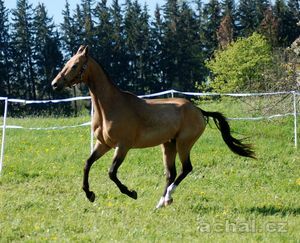 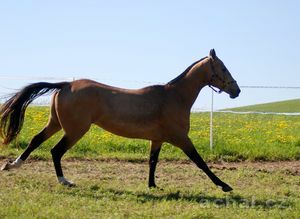 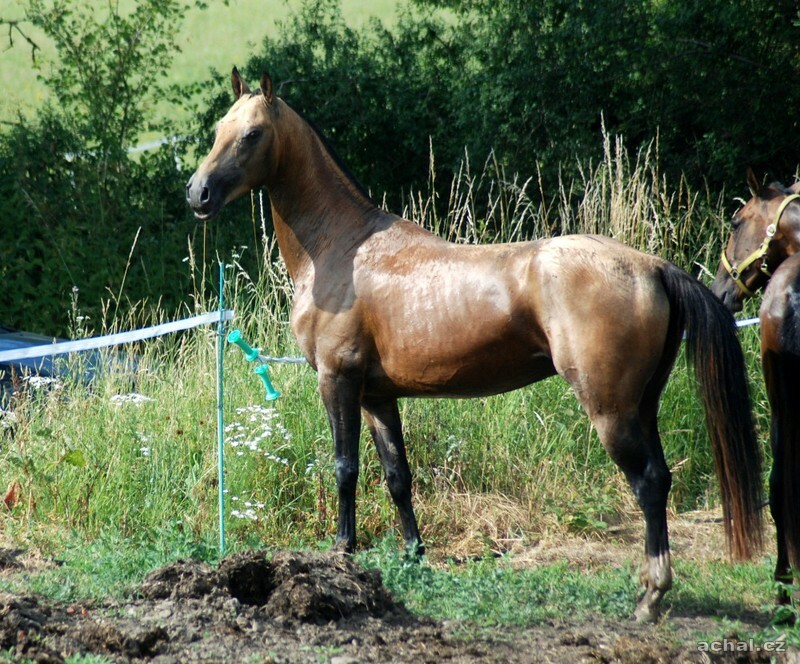 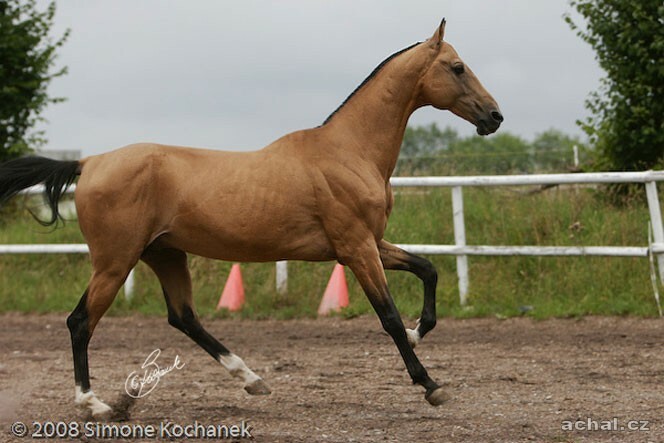 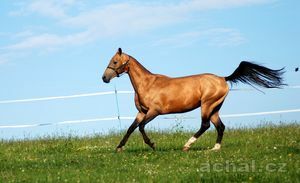 Khorog is a true brother stallion 932 Chorgos 2, born in 1966 sold in 1971 Německa. 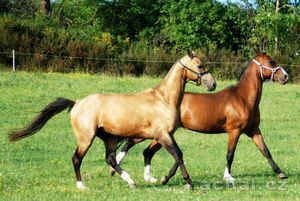 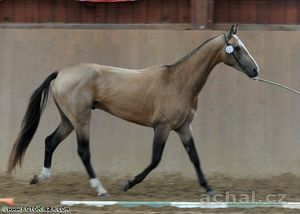 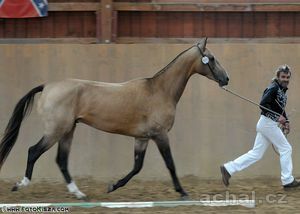 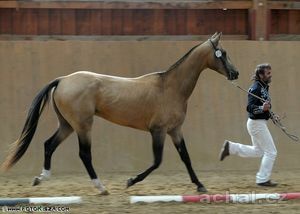 Chorgos in Russia still pre exports 9 purebred sire offspring. 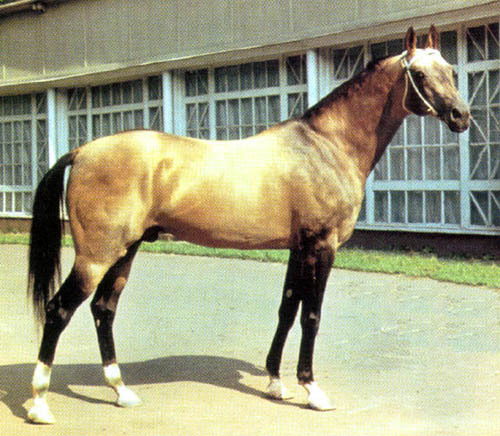 He ran as a two-year total of 5 races and always was placed. 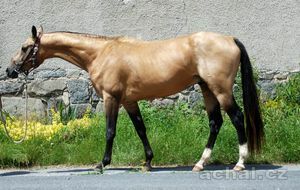 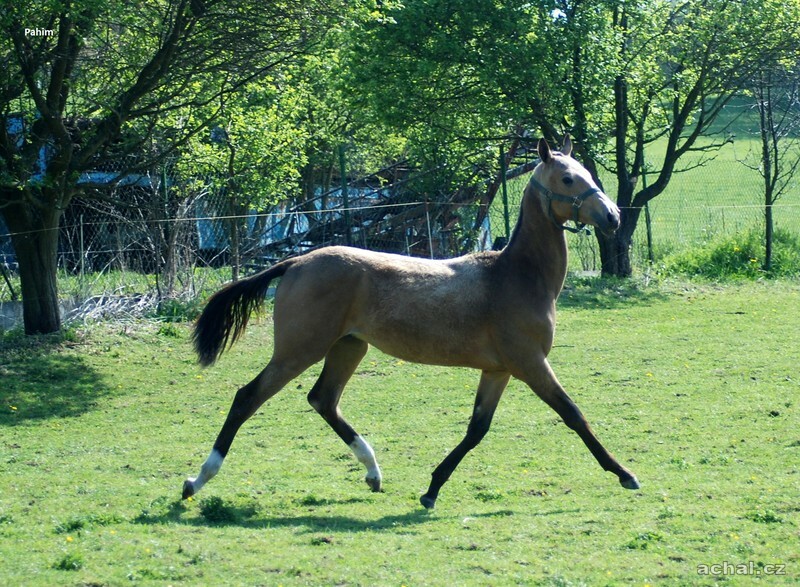 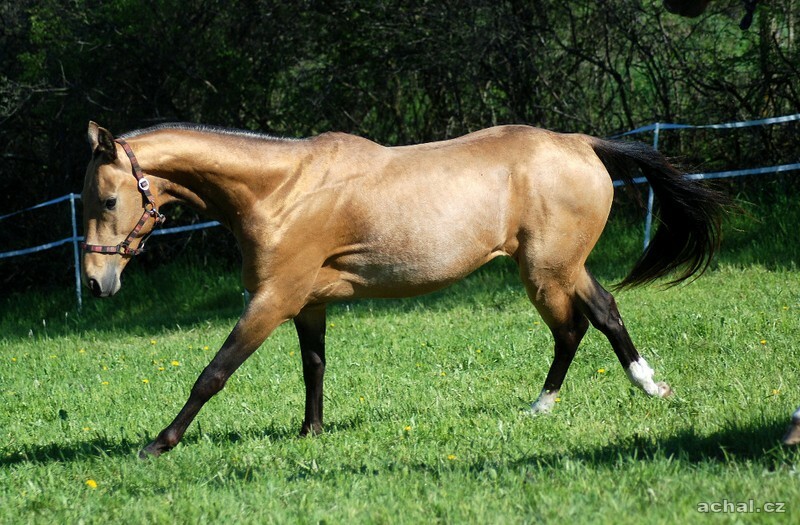 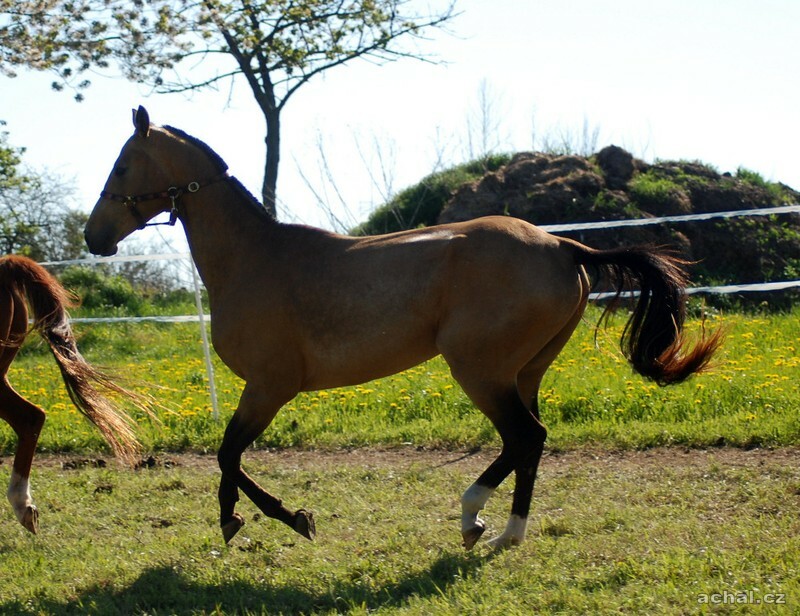 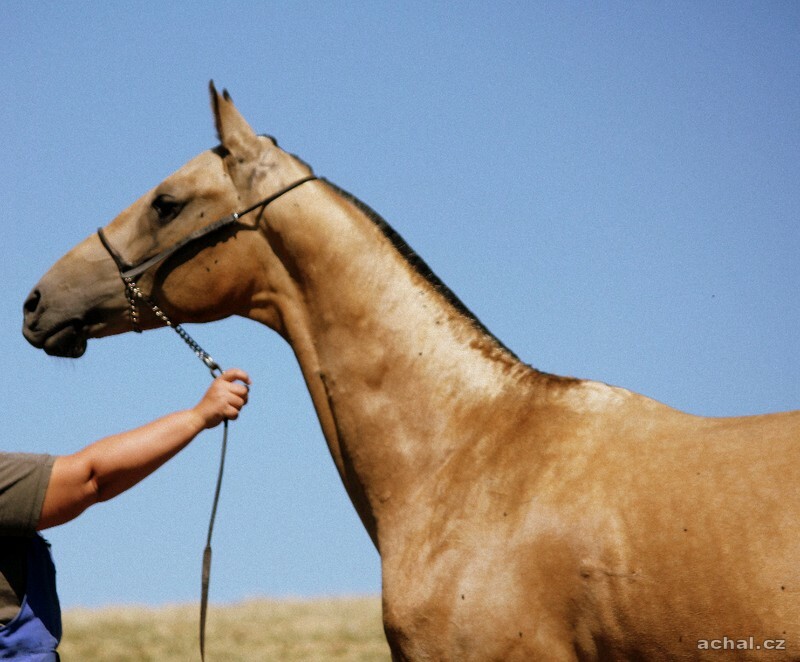 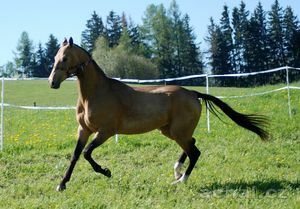 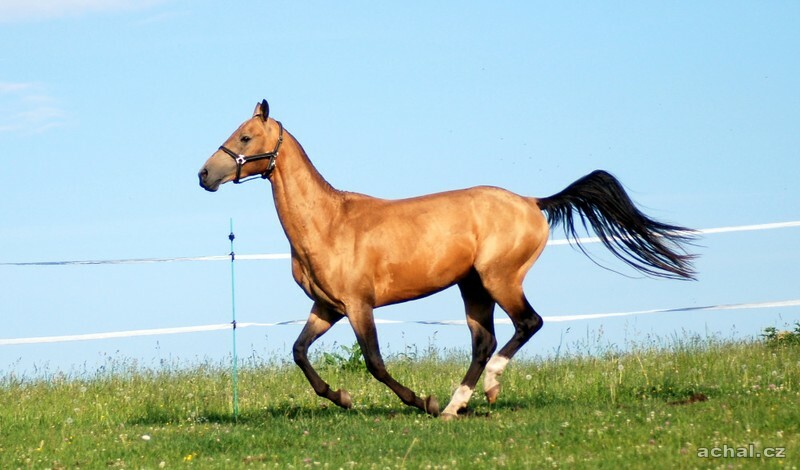 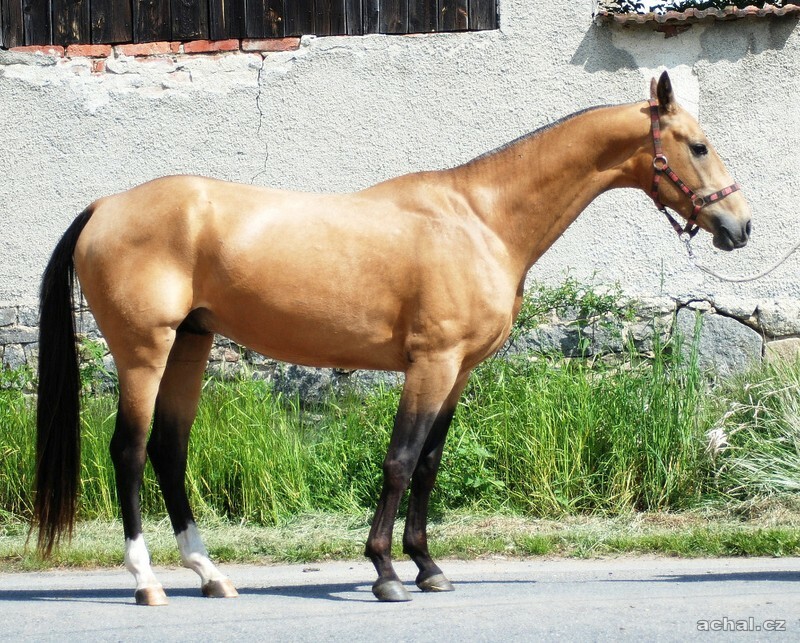 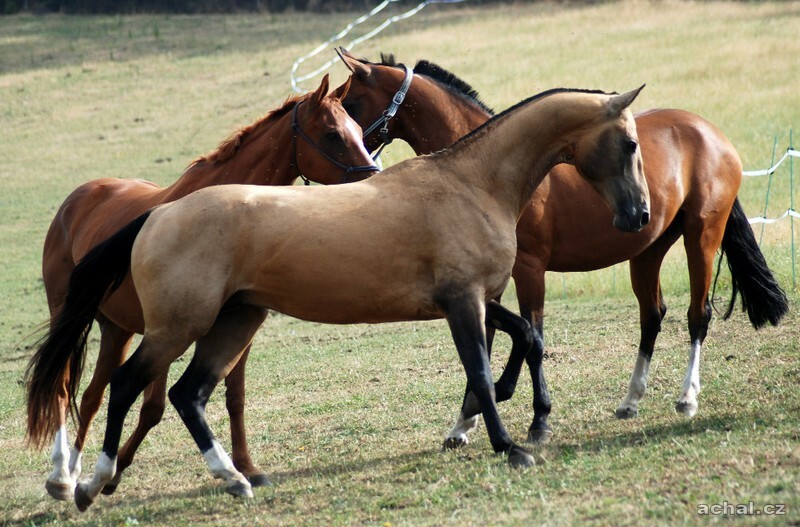 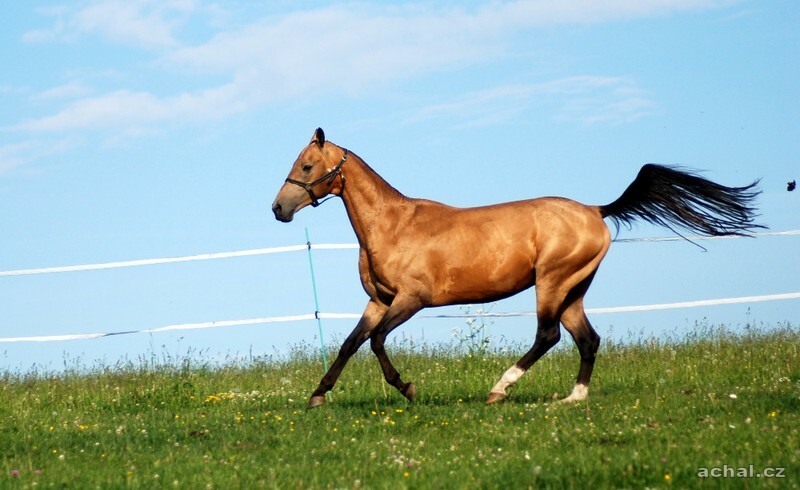 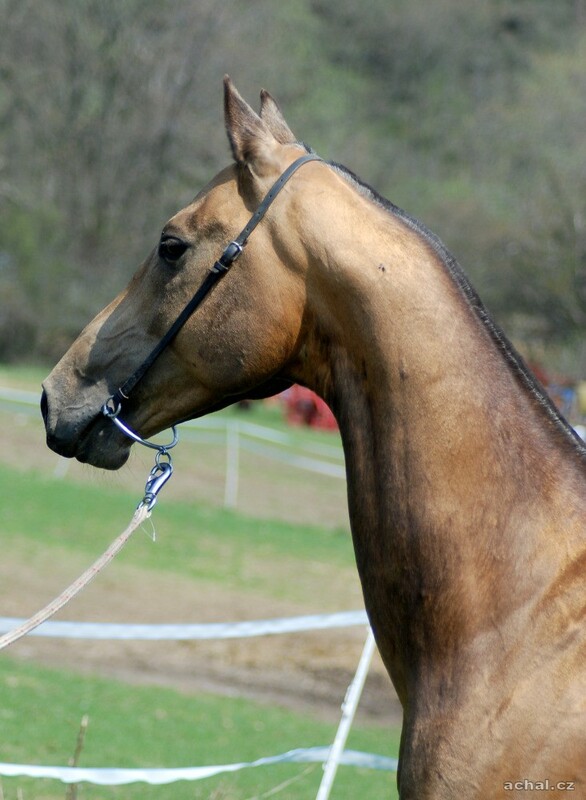 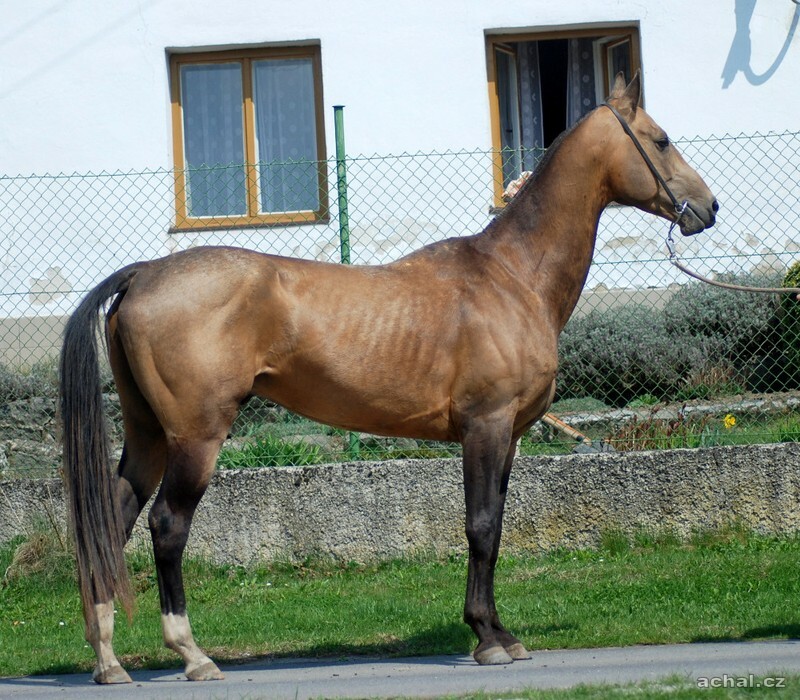 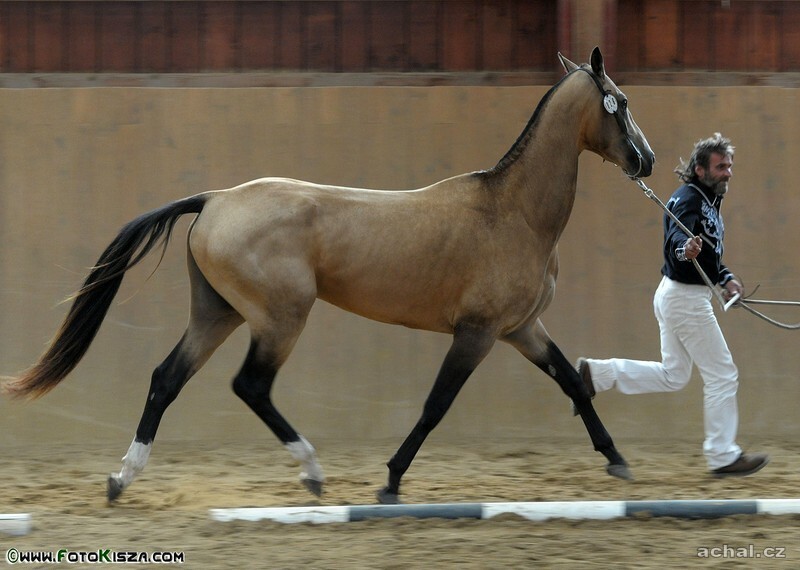 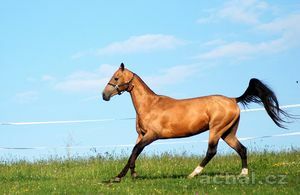 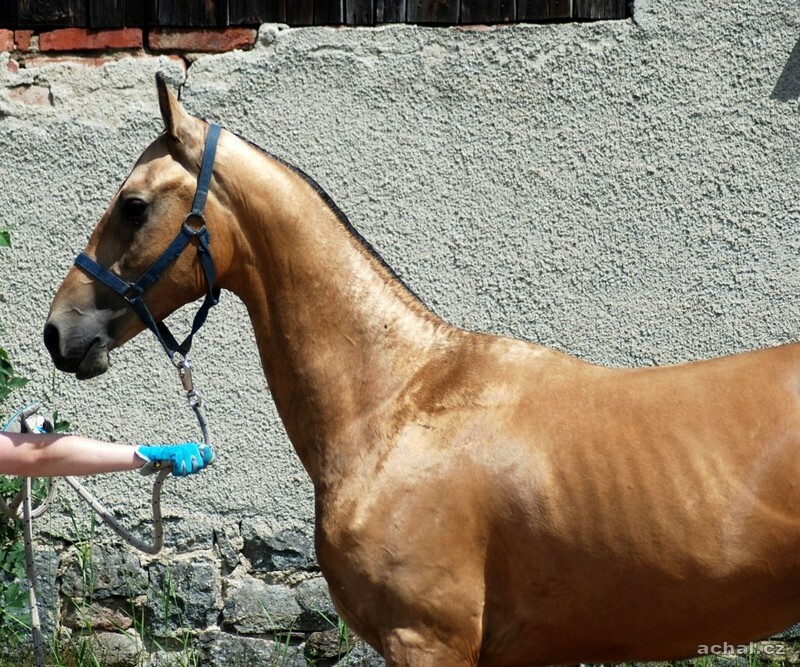 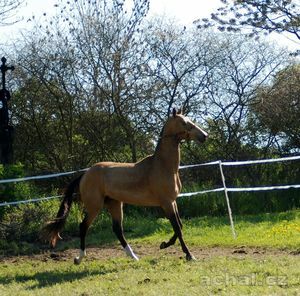 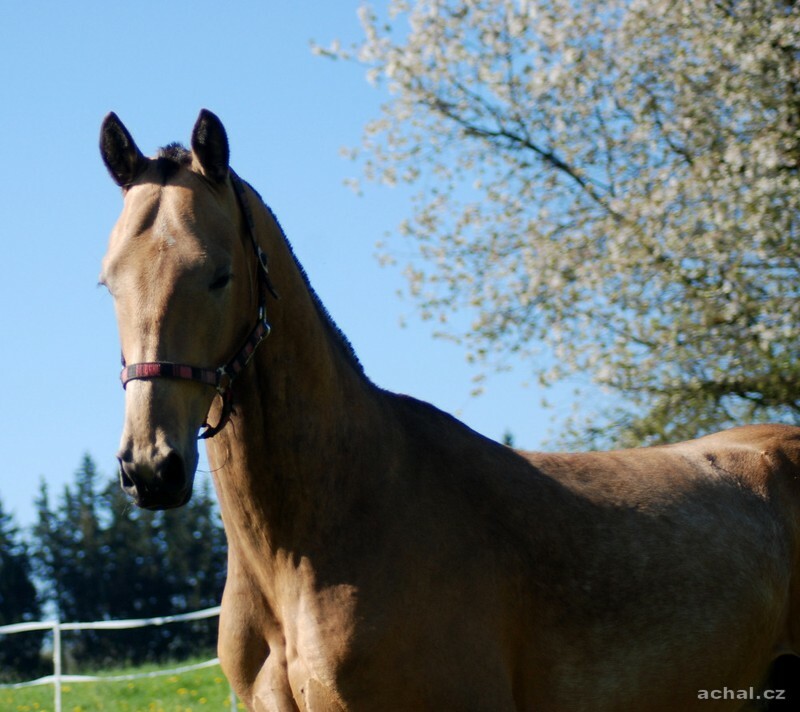 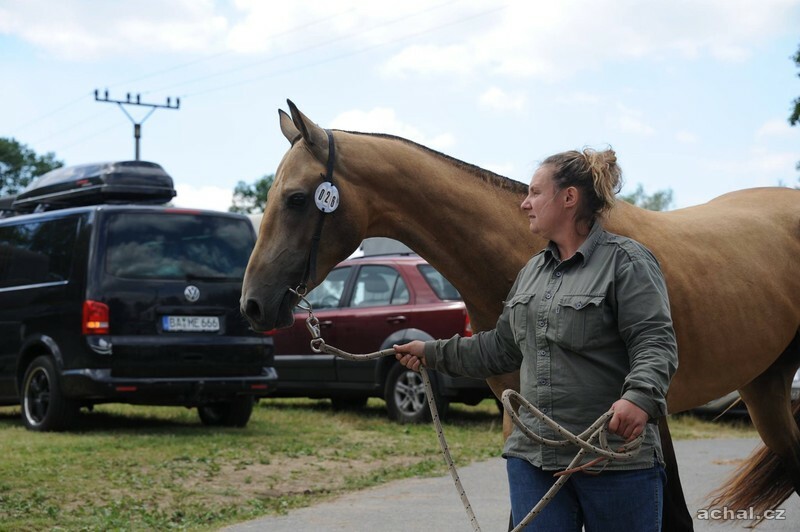 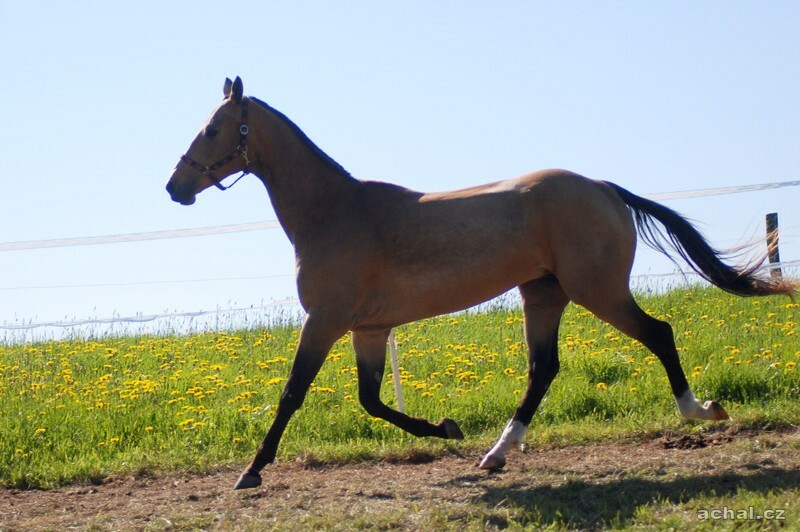 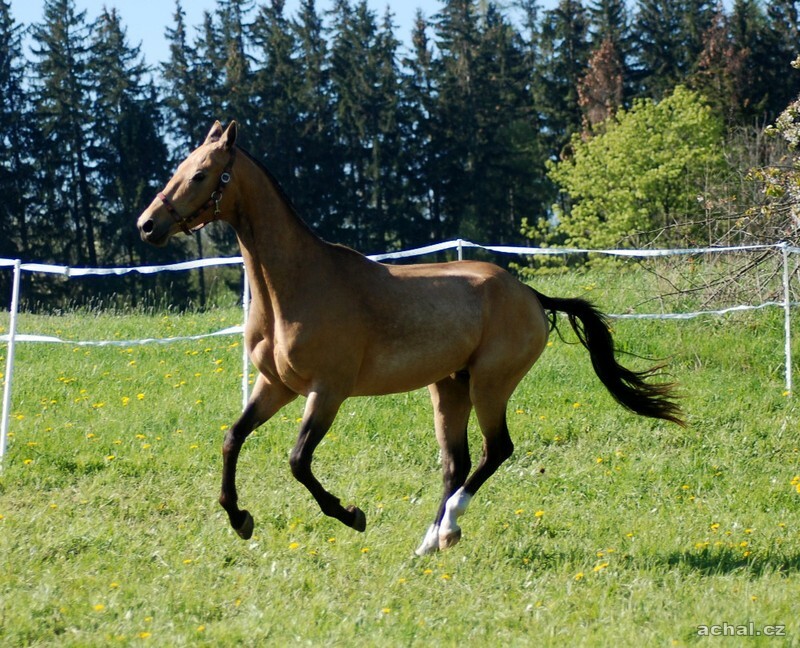 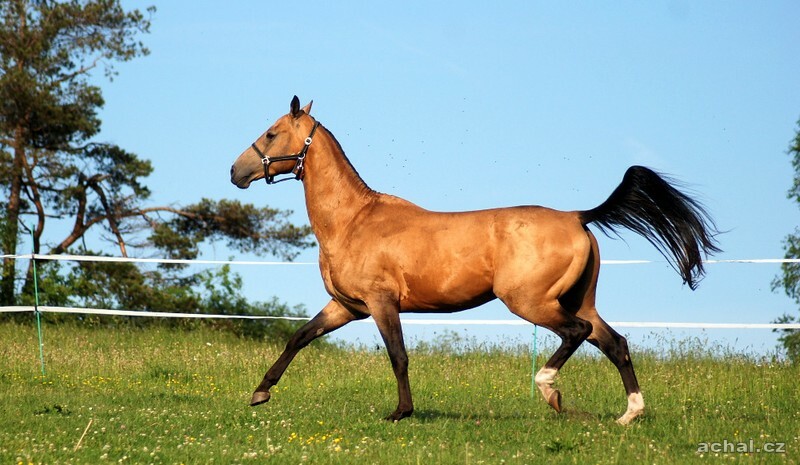 On five years was included in the breed, but used was limited in Lungovském stud prevailing distrust of the descendants Gundogar due to complicated charakteru.Next Chorog was sold to Germany where he gave many excellent offspring as mare Bulhara (Chorog-Gul) best mare Evropy 1999. 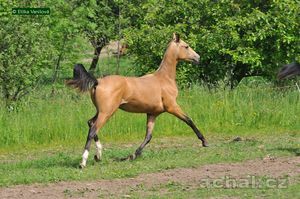 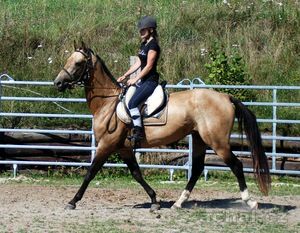 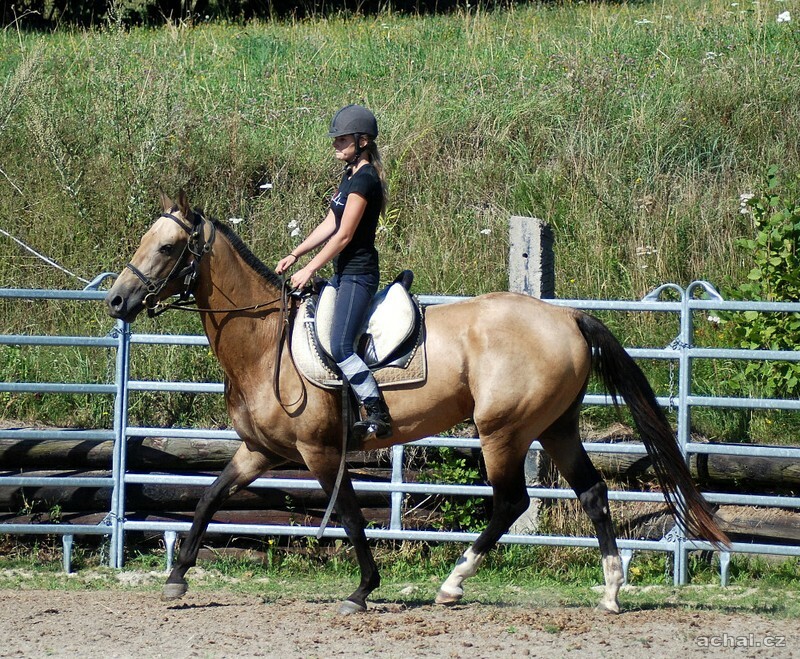 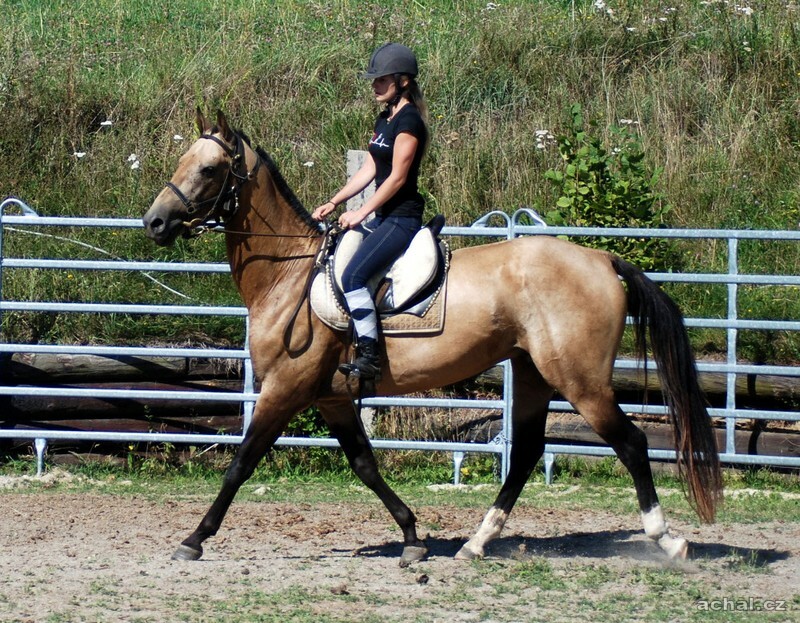 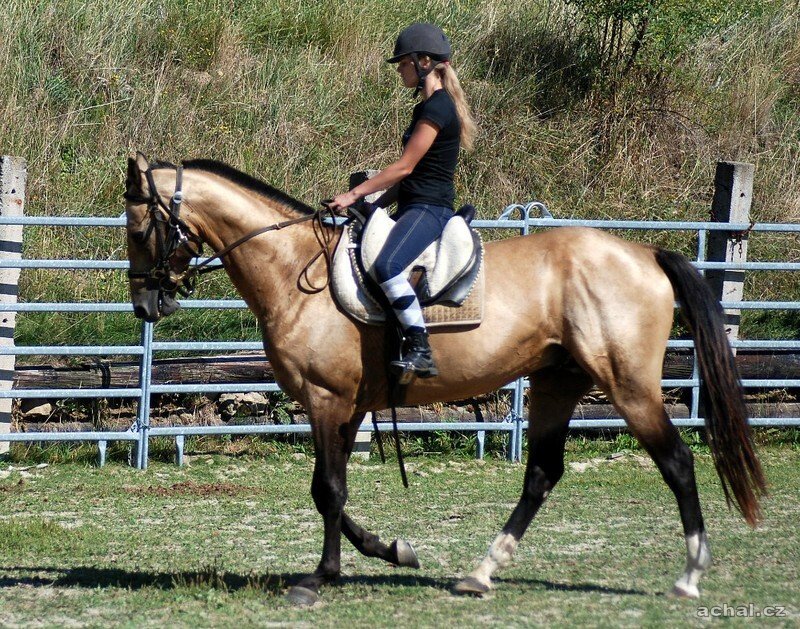 Successful was the offspring from Chorog in Switzerland.